And onward they pressed, though they’d never have guessed, what lay at the end of their run. Pease bumped into something nearby in the drifts, and suddenly let out a yell! In this lonely zone, where so few paths were known, there had ended a human lifespan. And his heart trembled inward, and grief racked his frame, and he found that he scarcely could stand. There were animal bones, rusty nails, cannon shot, and some pieces of cloth and old twine. Had the grave then been looted? Had wolves tunneled in? Had the body been carried away? He had yearned to discover the fate of another, but ’twas his own fate he found — mo chroi! 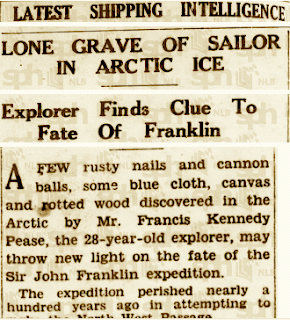 Perhaps the least well-known Franklin searcher of the modern era, Francis Kennedy Pease was no stranger to the polar regions -- indeed, one of his first voyages was as a midshipman aboard RSS Discovery, on its way to deliver a permanent headstone for Sir Ernest Shackleton's grave. Like Shackleton, Pease had been born in Co. Kildare; his father, Charles Pease, was a Major in the British Army. Frank Taaffe, one of the organizers of the Shackleton Autumn School in Athy, has an interesting post on his blog Eye on the Past, which gives further details on Pease's life and career. His voyage south was in 1927, but Pease did not venture north until 1935, when -- having received, by his own account, some kind of map from Knud Rasmussen -- he lit out in search of the logbooks of the Franklin expedition. The story sounds a bit dodgy -- had Rasmussen known of the location of such a treasure, it's hard to imagine his not having pursued it himself -- and then there's the nagging detail that the great explorer died in 1933, two years before Pease's expedition. Pease supposedly took with him one dog -- his Irish terrier! -- although by some accounts he also borrowed or purchased additional dogs in Churchill, Manitoba (including one, "Scottie," whose taxidermied remains may be seen at the Manitoba Museum to this day). It's said that he was accompanied by veteran trapper Angus MacIver, an articulate, capable man who contributed a number of articles on wolves and wolverines to The Beaver. And yet, of this seemingly substantial search, very little remains in the way of published accounts -- indeed, the only one I could find is a lone article from the Singapore Free Press and Mercantile Advertiser of 12 June 1935 (you can read the full text here). 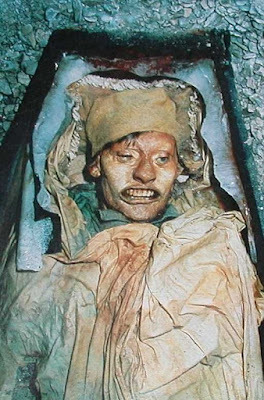 By Pease's own account, they found "the grave of a white man believed to be the last survivor of the Franklin expedition," located "250 miles north of Fort Churchill," along with a cairn beneath which were buried "the remains of a sea chest." The grave itself, as he described it, was "made in the Indian fashion ... of logs of spruce trees in the form of a tunnel, with both ends sealed by logs and earth" and "bore Indian hieroglyphics meaning 'white man buried here 1851.'" The relics from the cairn included "rusty nails and cannon balls, some blue cloth, canvas, and rotted wood," while the tomb, though not described as having been damaged, contained only some "animal bones." The article from the Singapore paper says that the items retrieved were put in the hands of the Canadian government -- presumably, in 1935, this would have meant the National Museum -- but searches of the online databases of its successor institutions (the Canadian Museum of History and the Canadian Museum of Nature) produces nothing filed under Pease's name. 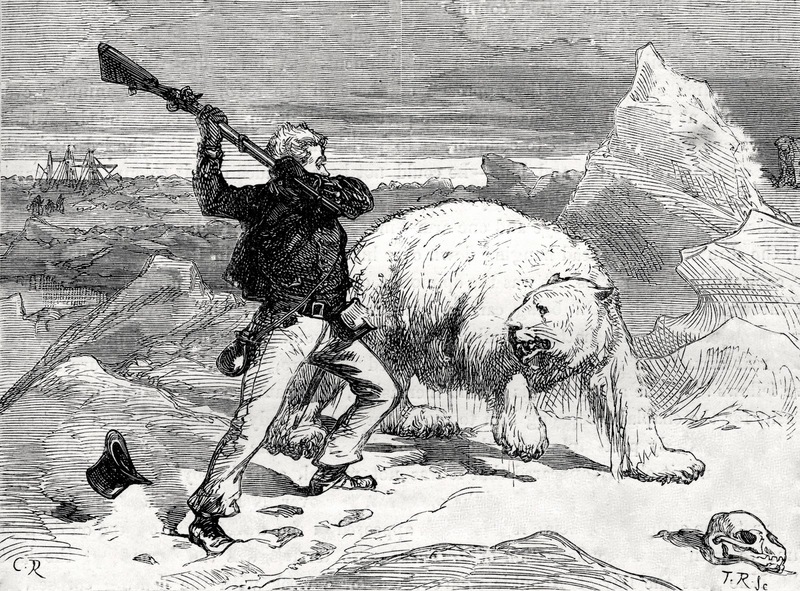 This was, apparently, Pease's first and last Arctic foray. According to Frank Taaffe's account, "After service in the Royal Air Force in World War II he spent the rest of his life as a landscape contractor dying in 1987." It's hard to know how much credit to give to his claims as to a Franklin grave -- but certainly he fits well within the gallery of obsessive amateurs whose curiosity was piqued by this greatest of Northern mysteries. Update 12/29: According to this article by historian Tina Adcock, Pease made it "no further north or west than Winnipeg"! The mystery deepens -- or perhaps doesn't. Might he have made the whole thing up? Just as those of us obsessed with Franklin's lost expedition were settling in for our nice winter naps, with visions of next year's dives on "Erebus" and "Terror" dancing in our heads, we've been rudely awakened by a fresh scientific study that's making the rounds. Its subject, in fact, is both old and new -- John Hartnell, exhumed from his grave at Beechey Island in 1986, and two samples collected and stored, but not studied until now: one thumbnail and one large toenail. The press stories have tended to vary between thumb and toe in their accounts, but in fact it was both -- and no "clipping" either -- that a team of Canadian scientists used to trace, over a longer period of time than had been possible before, young Hartnell's intake of various chemical elements. In preparing a voodoo spell, a person's fingernails and toenails are thought to be powerfully efficacious; just so here, science has constructed what the team has dubbed "Hartnell's Time Machine." For, while the visible part of the nail is only of relatively recent growth, the full nail -- from root to tip -- has a longer story to reveal: 19.5 mm in the case of the thumb, 22.5 in that of the toe. Combined, the nails have been used to trace Hartnell's food intake all the way back to June of 1845, just after the ships sailed, through to his death on 6 January 1846 -- nearly seven months. In particular, the team looked at lead, zinc, and copper exposure, as well as at nitrogen stable isotopes. The findings were then compared to a "reference toenail," one associated with a modern individual whose diet included red meat. 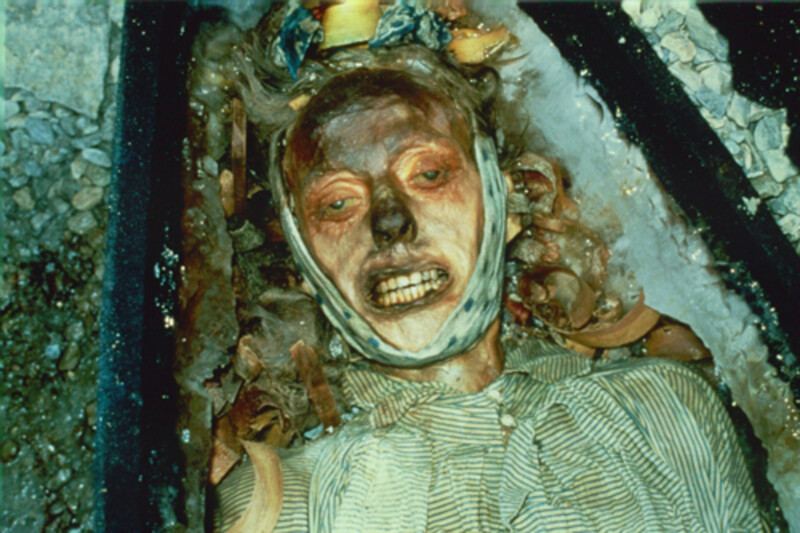 The conclusions of the study are fascinating: from the isotopic nitrogen analysis, it was possible to show that, throughout the period, Hartnell consumed no seafood (it's too bad that someone with a knowledge of sailors' eating habits wasn't consulted -- "there needs no ghost come from the grave to tell us this"). As to lead, the results, consistent with other more recent studies, suggest that Hartnell's exposure continued, but didn't increase significantly, during the expedition, though it did rise in the last few weeks of his life, possibly due to his having been given extra rations of tinned food, or some of the "wine for the sick" on board (wine was known for lead contamination at this time). It's also possible that weight loss and illness accounted for the higher relative concentrations. Copper was more of a constant, as was zinc -- though in the latter case, it seems that Hartnell began the expedition and finished it with a severe zinc deficiency. 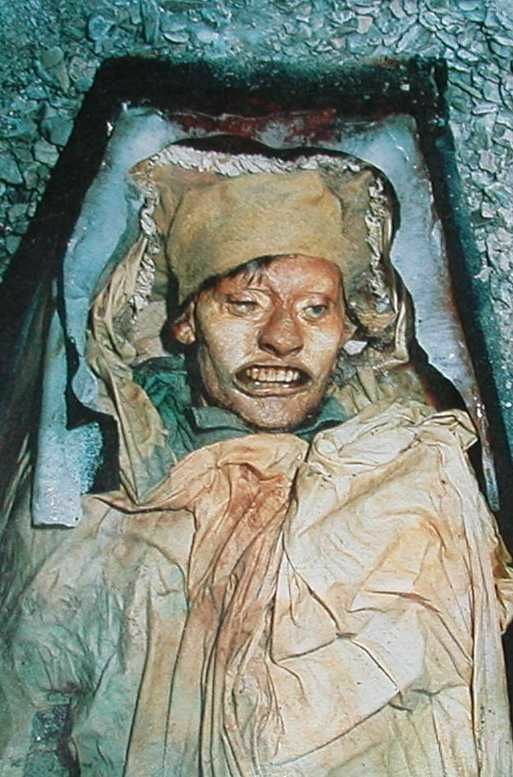 This condition would have increased his susceptibility to illnesses, including TB, and thus could have been a factor in his death. Unfortunately, nails from Hartnell's two grave-mates at Beechey were not available for comparison. A zinc deficiency could also cause other symptoms -- "depression, anxiety, lethargy, impulsivity and irritability," according to the study. 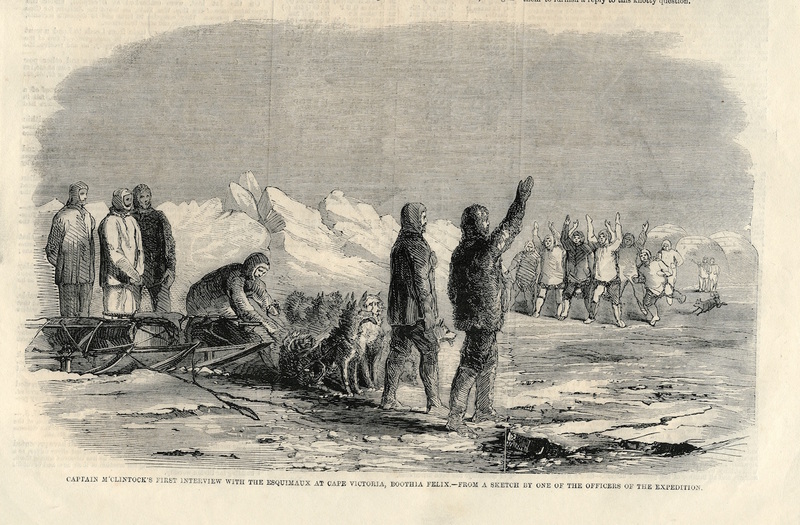 The only remedy would have been fresh meat, which we already know was very scarce indeed; the last time any of the crew would have enjoyed any would have been shortly after arrival in Greenland, when oxen brought on the transports were slaughtered. At the same time, it would be too bad if a zinc deficiency were to be taken -- as, unfortunately, it seems to have been in some press accounts -- as the new "single-explanation" theory. The lack of fresh meat, and conditions of the sailors, on board Franklin's ships would have been very similar to other British naval expeditions of the day, none of which suffered the catastrophic losses of Franklin's, and indeed a recent study (one of whose authors was the late William Battersby) suggests that other causes -- accidents, exposure, scurvy, tuberculosis, and other respiratory conditions -- played a far more prominent role, on the whole, in Arctic expeditions of the period generally. So this new study, while certainly welcome, doesn't necessarily change our prevailing understandings. The curious can consult the full study here -- it's available for purchase, or can be had via the libraries of subscribing research institutions. 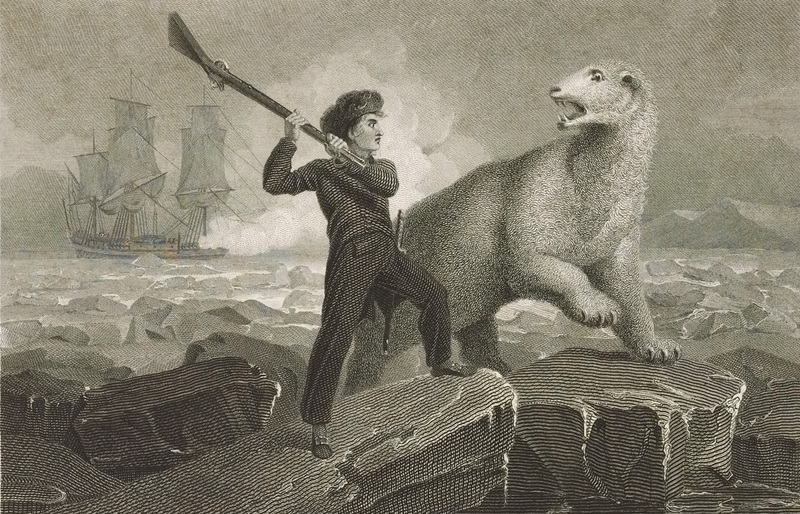 Two English nineteenth-century paintings that fall well within the Heroic Age epitomize the polar bear’s role in visual mythmaking: Richard Westall’s apotheosis "Nelson and the Bear" (1806) and Edwin Henry Landseer’s memento mori Man Proposes, God Disposes (1864). 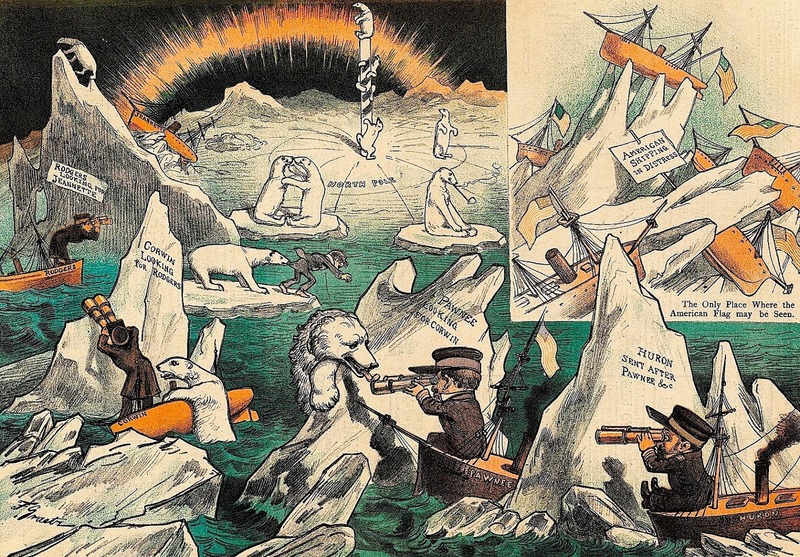 "Nelson and the Bear" and to a degree even "Man Proposes" follow conventions of the exploration narrative, a genre seeking to terrify and to titillate. Such dramatizations of the quest—hand-to-paw combat, hull-crushing bergs, scurvy, and starvation—hallowed soldiers and explorers, especially in premature death. By the time Landseer finished "Man Proposes," more ships and men had been lost in search of Franklin. 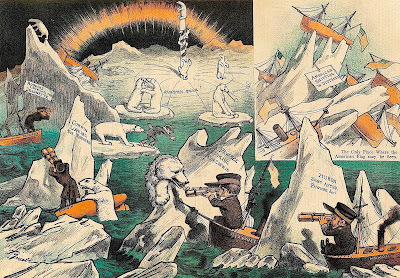 The futility of Arctic exploration was starting to register, but British hubris and vainglory persisted until 1912, when another hero—Robert Falcon Scott—perished at a pole, and an iceberg ruined both an “unsinkable” ship and the confidence of a nation. Michael Engelhard is the author of the just-published book Ice Bear: The Cultural History of an Arctic Icon and American Wild: Explorations from the Grand Canyon to the Arctic Ocean. Trained as an anthropologist, he lives in Fairbanks, Alaska and now works as a wilderness guide in the Arctic. Having just experienced a fantastic series of Franklin-related events in Ireland and England, I was reminded anew of how, at a very fundamental level, the Franklin fascination is a collective undertaking. Each and every person who falls under the spell of this story finds his or her own path into it, and once there, discovers specific areas of interest. Once that's happened, the space opens into one of collaboration: some learn all they can about one figure, one aspect of the story, while others focus on transcribing manuscripts, studying ships' plans, re-interpreting Inuit stories, or poring over satellite photographs. With the aid of modern technology, the pace of what's possible increases, and at every turn, collaboration can solve some of the most difficult enigmas. Some of this happens in the congenial company of the Remembering the Franklin Expedition Facebook group, but it also happens via e-mail, notes and comments on online blogs and forums, and through visits to far-flung archives and museums. Over the past several years, many enigmas have been solved -- or at least, had their basic questions clarified and evidence re-examined -- through this large and growing online community. All of which makes in-person gatherings all the more special. I was fortunate to be part of two of these while on my trip: first, the 16th annual Sir Ernest Shackleton Autumn School in Athy, County Kildare, Ireland, and second, the RTFE meetup at the Trafalgar Tavern in Greenwich. The Shackleton School, which I was delighted to return to after my first lecture there in 2009, was organized around specific talks and events: Huw Lewis-Jones launched and lectured on his and Kari Herbert's new book Explorers' Sketchbooks, while I was fortunate to do the same for Finding Franklin. 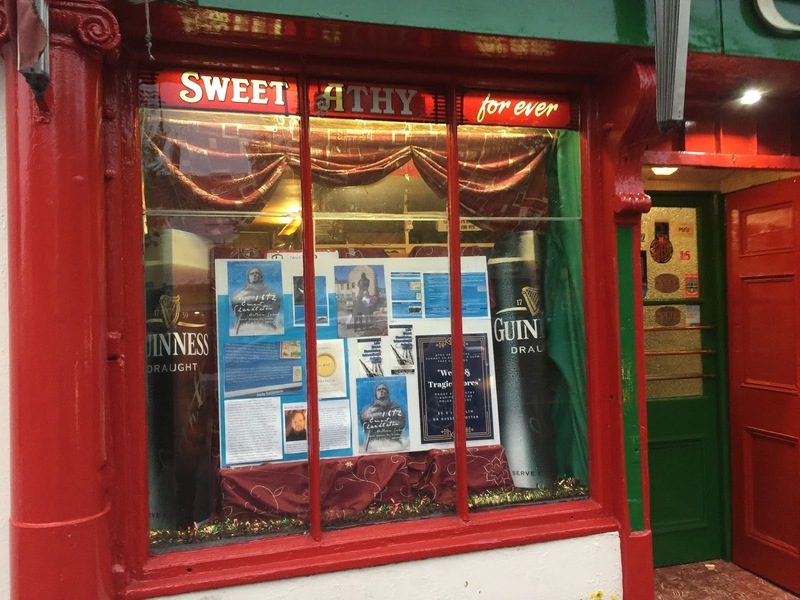 I'm particularly grateful to the folks at O'Brien's pub in Athy, who hosted my book launch, accompanied by a fantastic print representing John Torrington by local artist Vincent Sheridan, introduced by the incomparable Joe O'Farrell, followed by a lovely a capella rendition of "Lady Franklin's Lament" by Frank Nugent -- and concluding with the singular honor of being permitted to pull my own pint of Guinness at the sacred tap. Good fellowship and lectures on a variety of subjects from both poles followed, filling the weekend with new stories and new friends, and concluding with a fabulous literary reading at the Athy Arts Centre. There, Gina Koellner and I read from Gewndolyn MacEwen's "Terror and Erebus," while novelist Ed O'Loughlin treated the audience to readings from Wallace Stevens and Alfred, Lord Tennyson, followed by a section from his remarkable new novel, Minds of Winter. And yet, as delightful as my time in Athy was, the weekend finally came to a close, and I flew off to England for a new series of wonders, including a visit to Sir John Franklin's birthplace in Spilsby, Lincolnshire, research on the "Peglar" papers at the Caird Library, and a meeting with curators at the National Maritime Museum who are involved in plans for next year's large-scale exhibition of Franklin materials, scheduled for July of 2017. And yet, despite the value of these more "official" doings, it was the unofficial "meetup" of the RTFE at the Trafalgar Tavern in Greenwich which was, for me, the highlight of my time in the UK. For, despite our collaborative work and long history of shared interests, almost none of us in the group had ever met in person before. It's funny how well one can now know a person one has never so much as shaken hands with, and what odd details the online world leaves out. How tall is someone? What's their voice sound like? The gathering began early, at two in the afternoon on a rainy Friday, and continued late into the night, as, one by one, each of us had to leave to find our way to home and hearth. By the end, our bonds of fellowship had only grown greater, and now, when we see our profile pictures on Facebook, we'll know a bit more about one other. There was but one sad note in the midst of our conviviality: the loss of our dear friend William Battersby. All of us had known him, quite a few had met him in person, and some had worked quite closely with him on research related to the Franklin expedition. His had been a jovial and thoughtful presence, and somehow it seemed as though his spirit remained with us, as his friend Peter Carney rose, as did we all, with a toast in his honor. The good work that he did, and the memory of his constant questioning of what we supposed we knew but hadn't checked on, will forever be remembered among us. As the evening drew to a close, the talk was of the the large exhibit of materials related to the Franklin expedition, which will be opening in July of 2016 at the National Maritime Museum, before heading over to the Canadian Museum of History in Ottawa in January of 2017. 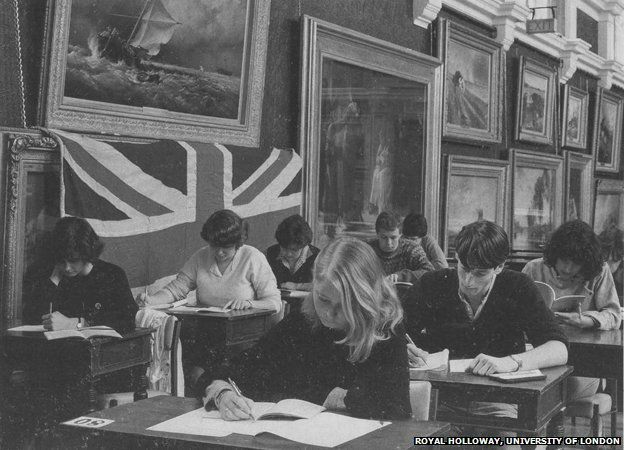 For those of us who clinked our glasses at the Trafalgar, those dates can't come soon enough! In the Franklin story there are just a few images that, without a single word to accompany them, tell volumes: the face of John Torrington seeming to stare forth from his coffin; the lone skull in a field of rocks at Erebus Bay; William May's still-life lithograph of the Franklin relics. 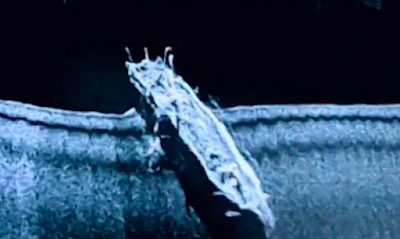 Certainly the sonar image of HMS "Erebus" was another, and to that may be added the even more dramatic scan made by Parks Canada of HMS "Terror." In it one can see many structures missing from her sister ship Erebus: the long and lovely bowsprit, the davits from which the boats once swung still attached to the deck, and the shadows of the deckhouse, masts and other fixtures. Indeed, it's possible if one places a plan of the ship over the top of the image, to see the correspondence of the vessel that enabled Parks to make its identity positive -- not that there were any other missing vessels of that period know to be in the vicinity! The ship appears a bit narrower than she actually is, and the bowsprit seems to be at an angle -- but these effects are due to the relatively steep angle of the sonar beam; like the beams of some artificial sun, the shadows it paints are an a steep angle, a golden sunset not solar, but painted by reflected sound. But like those other images, it raises as many questions as it answers: where precisely does she lie (we're not meant to know just yet, for the understandable reason that the security of the site is paramount); near what portion of land (which instantly becomes the ideal place for archaeologists to do work on the ground); facing in what direction? Was she piloted here or did she drift (the former seems, for now, by far the most likely). The Inuit testimony tell of a sudden sinking, but so far as can be seen, she seems in "ship shape" from stem to stern. Nevertheless, she sits in deep silt, which may yet disclose the damage, severe or slight, which brought her to her resting place. Even that place is a question: according to some modern Inuit accounts, the ship may have shifted in position about seven years ago, such that a mast was present above the ice of the bay -- a mast which may since have been broken off or carried away. Low tides that year may have also had something to do with it, And, however she reached her present resting place, the all-important when is yet unknown -- upon which the chronology of the "Terror Camp" on land, and the subsequent departure of some number of survivors, depends. For that answer, we'll have to wait at least until next year's dive season. Like a fine-toothed comb passing through tangled hair, the knowledge of the definitive location of HMS "Terror" in Terror Bay is having the effect of reshaping and sorting out historic Inuit testimony in unexpected ways. Nowhere is this more evident than at Terror Bay itself, where we now have to recalibrate everything we know with the awareness that one of Franklin's ships lay under the water just a short distance away. 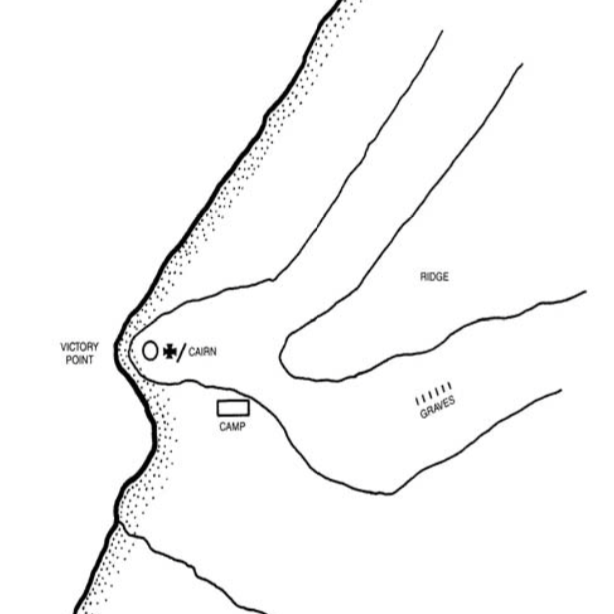 The Inuit testimony is consistent in locating a very large "tent place" with many bodies, as well as a series of shallow graves just outside it. This is almost surely the "tent place" described to Hall, filled with unburied bodies, along with clear evidence of cannibalism. With the Terror sunk nearby, the working assumption would be that this tent was the final home for many of her crew. Unfortunately, due to years of tidal action, as well as scouring by coastal ice, the surface remains of this site were already gone by the time Frederick Schwatka arrived to search for them in 1879, even though living Inuit elders verified that they had seen them at the spot: "The natives said nothing was to be seen where previously they saw many skeletons and other indications of the white man's camp, as it was so close to the water that all traces had disappeared." many searchers. 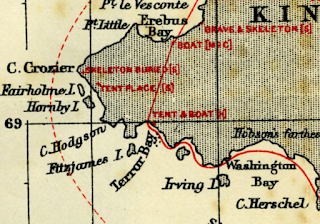 If so then perhaps Bayne's map -- which was, in the past, erroneously thought to apply to Victory Point, could refer instead to any of the several northwest/southeast trending coasts in Terror bay. A quick glance at Google Earth reveals any number of candidates; if we knew more precisely where HMS Terror was found, my money would be on the ones closest to that point. If we could relocate that spot, perhaps Peter Bayne's long-discredited map would, after all, turn out to be a map of a known Franklin location, and the key to finding a tomb which might -- even now -- contain not only human remains, but the kind of invaluable written records so many have sought for so long. 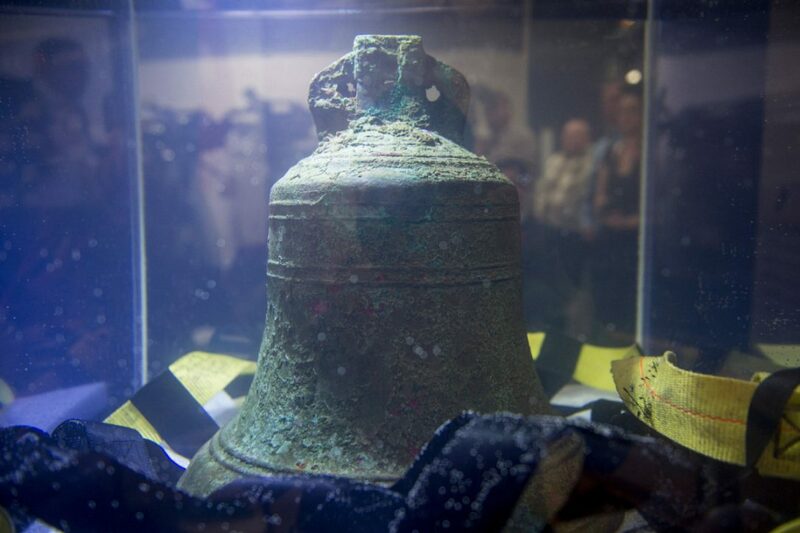 The discovery of HMS "Terror" in Terror Bay continues to make headlines around the world, even as, for the most part, the news stories repeat the same basic information. Now that the Parks team is back in Ottawa, we're learning a good deal more; for the benefit of those who may not have had access to the press event yesterday with Ryan Harris and Marc-André Bernier, I thought it would be useful to share the highlights of their comments and responses to reporters' questions. Most of the questions centered on the "Terror," though quite a few of the follow-up questions asked after "Erebus" as well. The Parks Canada team confirmed a number of things that had been reported earlier, but with notable new details. Although only able to manage three dives in the short time they had at the site, they also took new side-scan and multi-beam images of the wreck. Silt reduced the visibility, and Ryan Harris reported that the entire deck was covered with a layer of silt which -- though an excellent preservative -- made it difficult to see any smaller artifacts. Larger structures, though, were readily visible; Harris mentioned the flue pipe for the Sylvester Patent stove (this is closer to the forward part of the vessel, and distinct from the exhaust pipe from the engine which was seen in the previously-released video); both sets of davits were in place (in contrast to those of the "Erebus," which had been torn off, with part of one davit being the clue that helped pinpoint the ship). 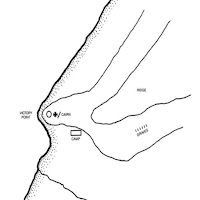 He noted the presence of an anchor cable (rope) coming out of one of the hawse pipes, trailing off a short distance, and what may be an anchor, very close to the hull. He noted the probability of intact ships' cabins, the partitions still in place, the hatches closed, suggesting a "largely sealed environment which would be ideal for the preservation of organic materials" including "otherwise delicate materials, written documents, charts, and material like that," calling the wreck "extremely promising." Another aspect of the "Terror" is how it got there -- whether it was re-manned, and whether indeed the site where it is currently located is the site where it was last occupied by its crew. Asked about the state of the hull, Harris replied that "certainly from the side scan and multibeam it appears to be remarkably intact from stem to stern," and noted the stunning state of preservation of the bowsprit. There will be, both Ryan and Marc agreed, a "lot of work" to be done, and there's great anticipation of next year's dive season -- as Ryan put it, "it's going to be a long winter." There were also some fascinating revelations about HMS "Erebus." According to Harris, Franklin's cabin is too damaged to reveal much, and is covered with collapsed beams that may have to be shifted or removed. However, they have had a peep into the senior officers' cabins on the port side -- these would have been those of the 1st and 2nd lieutenants (Gore and Fairholme). In these cabins, Harris described being able to see their bedplaces, including the ornate scrollwork on the sides of their beds or bunks, which according to the ship's plans have built-in drawers. These, along with the previously discovered seaman's chest, offer what Marc described as potentially "pristine pockets" of materials. Both Ryan and Marc also described their efforts to document evidence of Inuit presence aboard the ship, and their "harvesting" of useful materials, much of which ended up dispersed throughout the Arctic via trade. 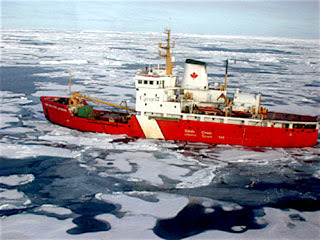 There was, however, one great disappointment, as it was revealed that the crew of the Martin Bergmann, which is funded by the Arctic Research Foundation, delayed notification of the find of the "Terror" for a week, during which time they apparently were able to return to Cambridge Bay, acquire a ROV, make their video, and provide the information for Paul Watson's exclusive story in the Guardian -- all before they let Parks Canada know of their find. Those eight days, when -- apparently -- conditions were ideal, were lost to the Parks team, and what could be learned this season considerably reduced. The crew of the Bergmann's explanation, that there was not an "updated protocol" in place, seems flimsy indeed. While they certainly deserve credit for the discovery, this revelation begs the question: what more might we have learned, if not for their silence? 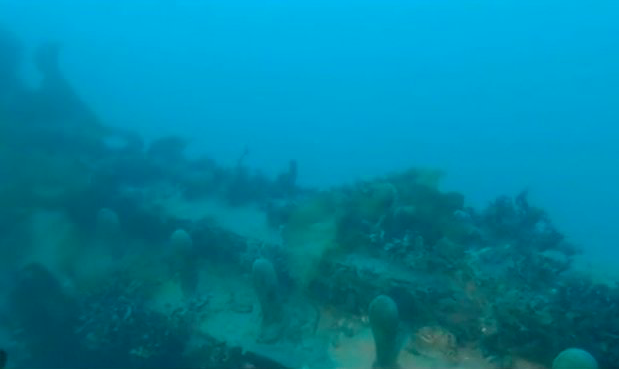 As most of us expected, Parks Canada today confirmed that the wreck first located on September 3rd by the research vessel Martin Bergmann is, in fact, HMS "Terror," the second ship of Sir John Franklin's 1845 expedition. The Parks team had to deal with rough weather, which churned up a fair amount of silt and made visibility poor, but despite this were able to examine enough of the ship to, having compared it with the detailed plans they have at hand, make the identification definite. Much of the press release, though, was devoted to highlighting the new degree of co-operation between Parks and various Inuit groups -- Inuit Heritage Trust, the Kiktikmeot Inuit Association, Nunavut Tunngavik Inc., and the Government of Nunavut. This is a crucial aspect of the find, and --as I noted in my blog a couple of weeks ago -- is something that has been in the works for a long time. It was evident, in the time between the initial discovery and Parks's statement, that many Inuit still felt anxieties over how the site and the relics found there will be treated, but today's announcement should, I hope, be reassuring. As I've mentioned, my personal view is that the wrecks and their contents technically aren't covered in the Nunavut Land Claims agreement, but the willingness of the present Government to treat them exactly as though they were, and to commit to ongoing cooperation, is nevertheless the right thing to do. There's property, and then there's cultural property, and it's clear that the "Terror" and "Erebus" are sites which enshrine, embody, and contain, the history of both Inuit and European-origin peoples. Like cords in a vast fish-net, they are too enmeshed in one another to be separated, and for the goal of the proper conservation of these vessels to be met, they must work together. The fact that "Terror" owes its discovery not simply to the historical Inuit testimony collected by Rae, Hall, and Schwatka in the 1850's, '60's, and '70's -- but also to that of Sammy Kogvik, a present-day Inuk who led searchers to the site -- underscores the rightness of this arrangement. But there is work to be done. It's encouraging now to know that the Parks Canada team can spend the still-brief search window next summer actually working on both ships rather than searching for them. The apparently much better state of the decks and great cabin of the "Terror" suggests that this might be the place to start; what we need now is not only the everyday items that have already been spotted, such as a bottle of wine or a desk drawer -- but the written records that will certainly be found. Will they be as enigmatic as the infamous Peglar Papers? Or will we get an accurate ship's log or other official record, which would certainly change what we know about the final fatal months or years of the expedition? For those of us who have already spent a large chunk of our lives wondering, it will be a long year! Inuit testimony about HMS "Terror"
As we await further word about the finding of HMS Terror, I thought it useful to collect together the principal Inuit witness as to its fate. Now that we know, at least, its general location, we can use that to help us separate out some stories from others, and eliminate from consideration accounts which place the ship elsewhere. The first person to hear reports that now clearly correspond with the Terror was, ironically enough, Francis Leopold McClintock -- the man who discovered the last known written record, and the man who gave "Terror Bay" its name, apparently unaware that one of the ships he sought so dearly lay beneath the surface only a few miles from where he stood! I should caution that this testimony has an issue -- Petersen, McClintock's translator, was clearly not familiar with the local dialects, and so one has to build in the possibility of misunderstandings. On King William island, about "halfway down the east coast," McClintock came upon a village of 30 or 40 natives, apparently well-supplied with wood as well as sundry artifacts from Franklin's men; McClintock saw there a sledge with large, curved wooden runners "which no mere boat could have furnished them with," a sure sign that they had come from the wreck of one of the ships. After obtaining items in trade -- six silver forks and spoons, some buttons, and "bows and arrows of English wood," McClintock asked about the ships. They had seen two ships, yes, one of which sank quickly before they could get anything from it, and the other of which had been "forced up on shore" and much broken -- it was from this latter ship that the wood had come. "Oo-na-lee now answered our questions respecting the one forced on shore; not a syllable about her did he mention on the former occasion, although we asked whether they knew of only one ship ? I think he would willingly have kept us in ignorance of a wreck being upon their coasts, and that the young man unwittingly made it known to us." "The latter also told us that the body of a man was found on board the ship ; that he must have been a very large man, and had long teeth: this is all he recollected having been told, for he was quite a child at the time. They both told us it was in the fall of the year — that is, August or September — when the ships were destroyed ; that all the white people went away to the " large river," taking a boat or boats with them, and that in the following winter their bones were found there." "[Kok-lee-arng-nun] and his wife agreed in saying that the ship on board of which they had often seen Too-loo-ark was overwhelmed with heavy ice in the spring of the year. While the ice was slowly crushing it, the men all worked for their lives in getting out provisions; but, before they could save much, the ice turned the vessel down on its side, crushing the masts and breaking a hole in her bottom and so overwhelming her that she sank at once, and had never been seen again. Several men at work in her could not get out in time, and were carried down with her and drowned. On this account Ag-loo-ka's company had died of starvation, for they had not had time to get provisions out of her. Again, this can only by the Terror, since the vessel which had been the source of wood was not seen to sink, but discovered after it had been abandoned. And yet, now she has been found, and apparently in good condition! But looks can be deceiving, as I mentioned in my previous post; a sudden breach in the hull would minimize the time that ice pressures would have to damage the deck and superstructure. What we really need to do next is to get a full survey of the Terror site, including a complete view of the hull; based on the extraordinary accuracy of the Inuit testimony so far, I'm willing to bet that it will show signs of sudden crushing, not unlike that which sank the Breadalbane. Oh, and one other thing: there will be bodies. 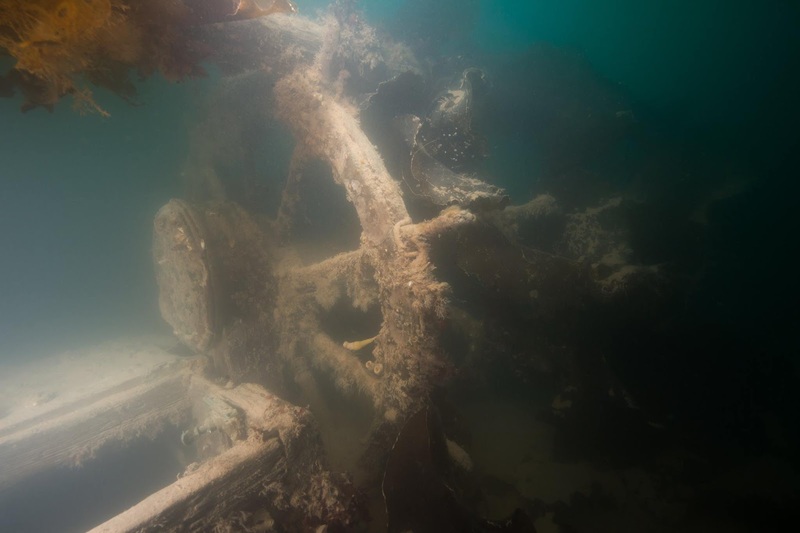 With the excitement around the discovery of HMS "Terror" -- a discovery yet to be fully confirmed by Parks Canada -- there's been all kinds of speculation in the press and online as to the meaning of this astonishing find. Scholars, such as myself, are as eager for new revelations as anyone else, but we've learned to practice caution, and to distinguish speculation from careful reasoning based on direct observation. Even then, what we see must be corroborated with what we know from other sources, be they ship's plans, historical documents, or (in this case) Inuit testimony. It's a process which doesn't happen overnight -- but of course the news must, and does. None of this work has yet been done, but here we are, presented with dramatic images and video. Of course, the imagination is stirred by such sights: there is the deck upon which Crozier must have stood, the wheel where the helmsman would have executed his commands, and -- though we've no photo of it yet -- perhaps his desk, with something hidden in the recesses of a drawer. The remarkable state of the preservation of these things has led many to say the ship was found almost intact -- but that's not necessarily the case. The hull, particularly the keel, has yet to be properly examined by Parks Canada's marine archaeologists, and given the lateness of the season -- new ice is already forming in the shallow areas along the coast of King William Island -- that may have to wait until next year. In fact, it's not clear from the current reporting that Ryan Harris and his team have yet had access to the ship at all. There's been a claim that the "Terror" was listing to starboard -- then a statement that it was actually upright -- then a claim that she must have "gently slipped to the sea-bed." 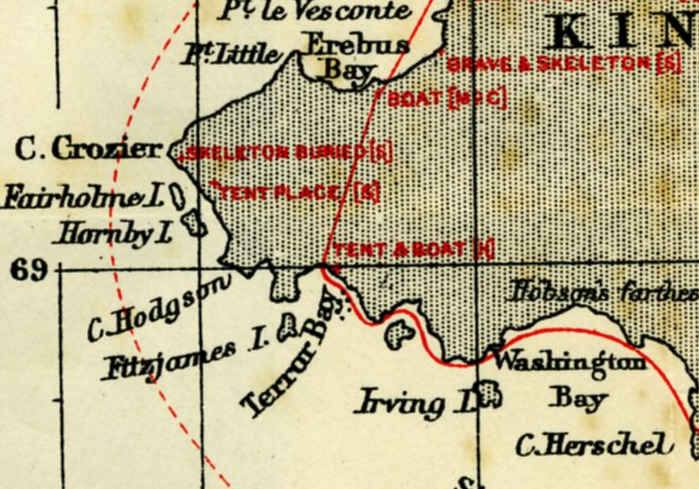 There's even speculation that her presence in Terror Bay is evidence that she was abandoned in an orderly manner so that the men could be moved to the "Erebus," which as we know made it further south. But we have absolutely no evidence for this; the hull has not been examined. I might mention at this point, the Franklin search ship HMS "Breadalbane," which was nipped by the ice and sank in scarcely twenty minutes -- and yet, strangely, when found by Joe MacInnis in 1981, she was similarly found erect on the sea-bed, her masts intact -- one of them still with a sail or two -- and the ship's wheel intact. It may in fact be the rapidity of the sinking which had the effect of preserving certain features; being found intact on the sea-floor, it would seem, is not necessarily evidence of having arrived there gently. HMS "Terror" found at last! It's hard to overestimate the significance of this new and magnificent find: the second ship of Sir John Franklin's expedition, HMS "Terror," has been found. 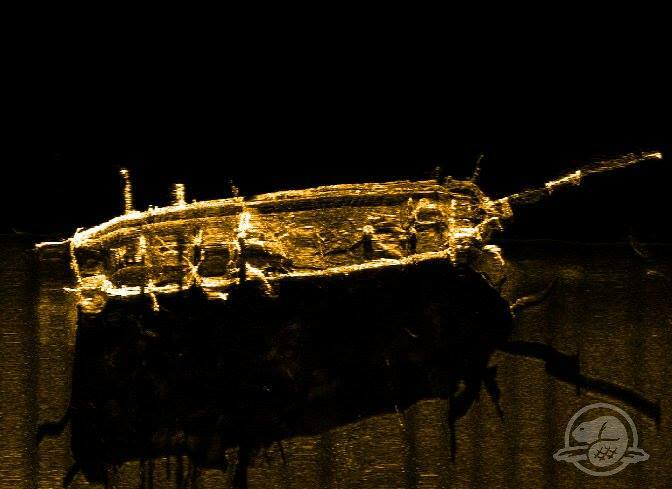 Initial images show her to be in far better condition than her sister ship, the "Erebus" (found by Parks Canada searchers in 2014), with her hatches battened, her bowsprit still in place, and many of the glass panes in her captain's cabin still intact, it's enough to warm the heart of any marine archaeologist -- or perhaps give them a heart attack! -- certainly a discovery that exceeds anyone's (mine included) wildest imaginings as to the vessel's state of preservation. 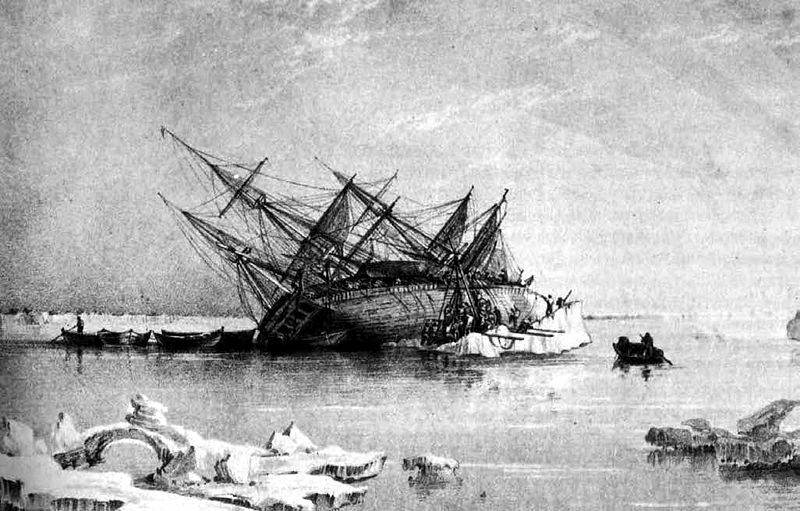 Initial accounts are short of precise details, and it's far too early to speculate as to exactly how this might revise our understanding of the final stages of the Franklin expedition. The ship-shape status of the vessel certainly indicates that she was left behind during a stage at which naval discipline and order were still intact. And yet, at the same time, we don't yet know the nature of the damage that brought her to the bottom. What we do see -- a vessel piloted to this location, and sunk within view of shore well to the south of the initial abandonment in 1848, vindicates the Inuit testimony as well as David C. Woodman's view that, based on said testimony, either or both ships must have been re-manned (I'd say both, at least for a time). Some press accounts speculate that after "Terror" was left here, the remaining sailors sailed further aboard "Erebus," but we don't yet have any clear timeline. The discovery of a "desk with open drawers," however, points the way to one possibility: some dated document -- almost any would do -- on board either vessel could sort things out in a jiffy. The far better state of preservation of "Terror" suggests that it would be the place to start. 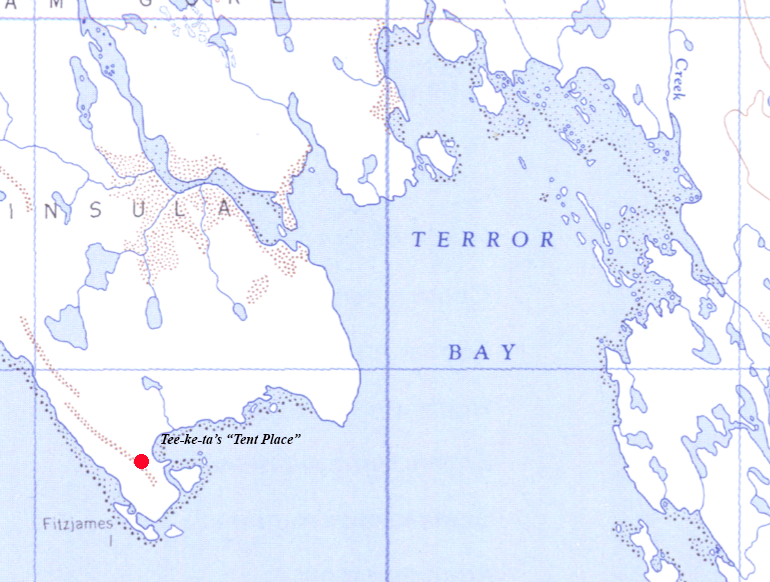 The location is almost too ironic for words -- having the "Terror" found in Terror Bay seems, on the surface, even more bizarre than in the 2014 parody account on This Hour Has 22 Minutes, in which the fictitious "Inuit storyteller" Philip Ayarowaq, drily noted that “the elders tell of a ship of white men that was stuck in the ice off Queen Maud Gulf, or as we call it, ‘White Man’s Sinking Spot.’” How the ship could have escaped notice, so near to a shore where dozens of searchers passed for decades, is difficult to explain. Its presence there completes a weird symmetry, as on the opposite side of the Graham Gore Peninsula in Erebus Bay, the eponymous vessel was, at least for a time, anchored, though we now know it made it further south. It's early days yet, though, and I think we should all work to avoid undue speculation -- a new discovery as significant as this one doesn't just add to the story, it casts unknown shadows in every direction. What we can say, with confidence, is that the Franklin mystery, far from being somehow solved, is once again made more complicated. Already there's talk of raising the "Terror" -- an idea which, though suggested by the seeming good state of the ship -- seems premature to me. All the Inuit I know on King William Island have hoped, over many years, for a find like this, not simply because it would vindicate their ancestors' stories or bring media attention -- but because it would bring economic growth, which is so sorely lacking in the North. Well before such a thing should be considered, we must ask, as with all such finds, what can we learn? And how can what we learn benefit those whose histories are as significantly linked to the "Terror" as they were to the "Erebus" -- the Inuit? 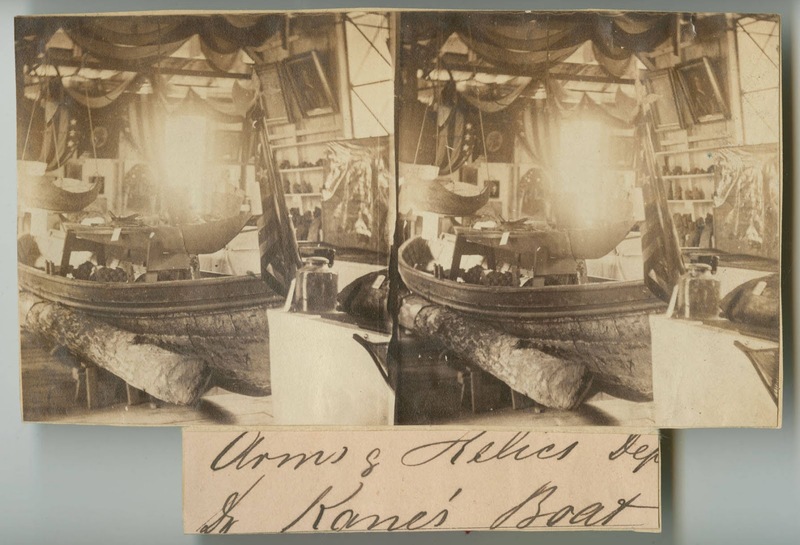 The Fate of Dr. Kane's boat, the "Faith"
“The Faith at my suggestion was patched up and exhibited at the Centennial Exposition at the south part of the United States Government Building. An evening after the exposition had closed it fell in pieces, a wreck, rotted out." One wishes that someone had, at the time, secured some small bit -- a fragment of a gunwale, or a plank -- and perhaps someone did, and it will turn up somewhere. But for the "Faith" herself, it seems to have been her destiny to hold herself together just until the Nation's centennial, and then fall to pieces all at once, like the wonderful one-hoss shay of legend. Here at Visions of the North, I've been following Parks Canada's search for Franklin's ships almost from the very beginning; while the blog wasn't yet online for the search led by Robert Grenier in 2008, I interviewed him the following November in Greenwich. I even covereed the absence of a search in 2009, and have posted about each year's search thereafter. 2014, of course, was the annus mirabilis -- the year that Franklin's flagship, HMS Erebus, was finally found -- and 2015 followed with the recovery of a fascinating array of artifacts from that vessel, many of which, although still in conservation, have already been displayed to the public. It's fair to say that, every year around this time, anticipation is keenly felt and hopes run high. This year's search looks to be a modest one, with only a couple of days diving on "Erebus," and perhaps a week or a little more pursuing her sister ship "Terror." Divers plan a site survey of "Erebus" looking at the stability of the wreck and determining if there have been any significant changes; meanwhile, in the Victoria Strait area, it's hoped that a side-scan sonar search of the area following the drift path of ships or débris from the last recorded location of "Terror" might shine some light on its fate. While my own view is similar to that of Dave Woodman -- that the ship is more likely to be found within the horizon line from the Erebus Bay encampment -- one can't entirely rule out the possibility that the "Terror" met its fate further north; as I noted in my last post, the Inuit testimony about that vessel, substantial as it is, doesn't give us a clear, unambiguous location, unlike the wreck at Utjulik, which we now know to have been "Erebus." The big news this year isn't so much the search itself as it is the development of a carefully-negotiated set of agreements and protocols, followed up by a number of meetings with Inuit communities. Parks Canada, to its credit, is going above and beyond the letter of the Nunavut Land Claims Agreement; while there's an argument to be made that maritime wrecks of foreign naval vessels aren't covered, they are following all the procedures that would be followed if they were. I think this is an important step, and from what I've heard, Inuit in the Kitikmeot region, as well as Nunavummiut generally, are pleased with these steps. In addition to community outreach, there's a clear signal that, from the 16.9 million allocated for the search over the next five years, there will be a significant commitment to what's described as a "multi-purpose infrastructure" including economic opportunities in Inuit communities. In another important development, a "Franklin Interim Advisory Committee" has been established, whose members include the Kitikmeot Inuit Association (co-chair), community representatives from Cambridge Bay and Gjoa Haven, Inuit Heritage Trust, the Government of Nunavut, Nunavut Tourism and Parks Canada. "[The Franklin search] would more meaningful if it could also contribute something to the fragile northern economy, [and] to the generation of young Inuit across the territory. Our histories, after all, are tangled up together." Where to look for HMS "Terror"? With the discovery by Parks Canada's marine archaeologists of HMS "Erebus" in 2014, the burning question has been the location of her sister ship, HMS "Terror." This year's search by Parks is planned to focus on the Terror, though there will be some new dives on Erebus as well. One might assume that, with one ship located and identified, it might be possible to narrow the range of sites to search for the second vessel, but that's not necessarily the case. In fact, since the Inuit never knew the name of either vessel, it takes some considerable review of the available testimony to sort out which tales refer to which ship; only then can we begin to form a clearer view of the possibilities. And, as was true of the 2014 find, it's mainly but not solely Inuit testimony that we need to consider. One account that may deserve fresh attention is that given to L.T. Burwash by Enukshakak and Nowya in 1929, describing a cache of crates "northeast of Matty Island," along with wooden planks washed up on the shore, presumably from a wreck "three quarters of a mile off the coast of the island." Since we know that, if indeed this is a Franklin ship, it could only be the Terror, then this testimony offers one line of possibility. Similarly, any other sightings of ships at sites some distance from the known location of Erebus can, if accurate, only be of Terror -- these would include the ship possibly seen by Anderson's men in 1855 somewhere off Ogle Point. The old man and his wife agreed in saying that the ship on board of which they had often seen Too-loo-ark was overwhelmed with heavy ice in the spring of the year. While the ice was slowly crushing it, the men all worked for their lives in getting out provisions; but, before they could save much, the ice turned the vessel down on its side, crushing the masts and breaking a hole in her bottom and so overwhelming her that she sank at once, and had never been seen again. Several men at work in her could not get out in time, and were carried down with her and drowned. Apparently, this ship's sinking was visible from on or near shore, and Inuit were present to witness it. 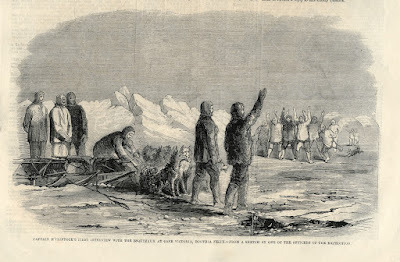 Since the Victory Point record indicates both ships were intact when abandoned, and Inuit only learned of the Crozier's landing site (from McClintock's interpreter) in 1859, this event must have taken place after the ships were re-manned. 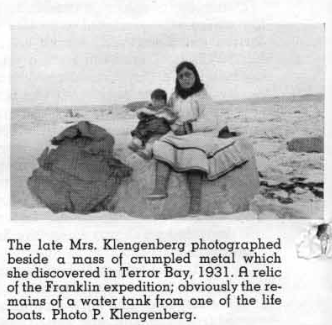 There's good circumstantial evidence that this was the Terror; if we take the "Too-loo-ark" of this story to be Crozier then it would be the ship aboard which the Inuit often saw him, and the line in the "Peglar Papers" about the "Terror Camp" being clear suggests that the survivors from that vessel camped on the land. The likeliest site for this would seem to be Erebus bay, and as Dave Woodman has noted, the "visibility from shore" horizon line enables one to project an area of high probability (you can read his new, detailed account of this here or via my Franklin search archival pages). At the same time, there are those who still believe that it's more likely that the Terror foundered before reaching that area. It seems significant to them that much of the recovered material from the Erebus Bay site is in fact associated with the Erebus, whereas if the Terror sank near there, more material from that ship might be expected. This was the original plan of the 2014 expedition, which took its name from the Victoria Strait, the goal of which was to locate the wreck or sunken debris from Terror. And now, in 2016, it seems that this is once more the primary search area that's been chosen, though of course it's also possible that ice conditions may limit or prevent a search there, as they did in 2014. It should be remembered that it was only after the disappointment of being unable to reach that year's goal that the Parks Canada team fell back on a further search in the Wilmot and Crampton Bay area -- and that it was that very search that finally revealed the golden sonar shadow of Franklin's flagship. Sometimes, the humblest objects of daily use tell a tale more eloquent, more rich and complex, than anything we could gain from written records. Such is certainly the case with the material relics of the Franklin expedition. Setting aside those with greatest seeming significance -- Franklin's Hanoverian badge, the infamous dipping needle, or Des Voeux's shirtsleeve -- some of the most common items recovered have the greatest potential meaning for those attempting to reconstruct the last months of the Franklin expedition. I refer, of course to utensils -- forks, spoons, and the occasional knife -- which were recovered by many early Franklin searchers from Rae to Schwatka -- and which, even today, have not yet been systematically examined for what they can tell. The utensils, most of them quality silver plate, were initially recognized on account of the family crests on their handles, which showed them to be from the families of officers such as Franklin and Crozier. Franklin's distinctive crest -- a conger eel's head between two sprigs -- was the most commonly found, suggesting that his plate had been first and widely distributed among the sailors; perhaps the most poignant of the crests was that of Fairholme -- a dove with an olive branch and the motto "Spero meliora" -- I hope for better things. 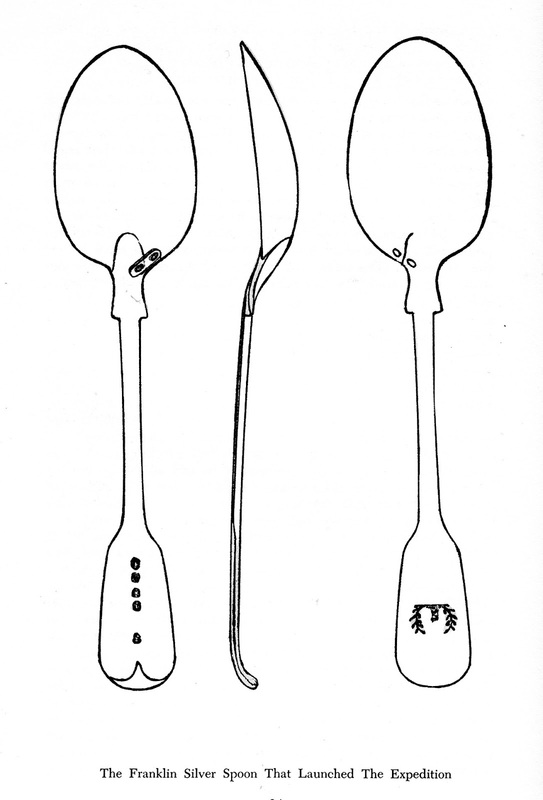 And yet there's more: on the stems and undersides of these same spoons and forks, there are found the scratched initials of other men, most of them ordinary seamen. The only explanation seems to be that, prior to the abandonment of the "Erebus" and "Terror," the silverware of the officers of both ships was distributed to the men for their use. In some cases, as with Franklin's, this was because the officer in question was deceased -- but the principal reason, doubtless, was to preserve the silver plate without burdening any one party with too large a quantity. And, since the silver plate from the officers from each ship was distributed to sailors aboard the same vessel, the discovery of a fork or a spoon -- provided its provenance can be definitely settled -- may give us a very likely indication of the path of the crew of that ship. 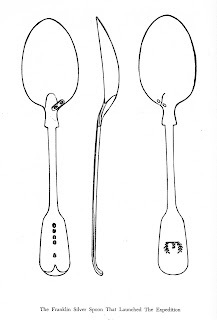 The pattern seems suggestive -- for instance, nearly all of the utensils recovered by McClintock at Cape Norton on the eastern side of King William Island were connected with the "Terror" -- there were two Franklin spoons marked "WW" (William Wentzall, seaman) and WG (William Gibson, steward), both of the "Terror," along with a Crozier fork and a teaspoon of Alexander McDonald, assistant surgeon. Only one item -- a Fairholme teaspoon -- was associated with the "Erebus." Now that we know that the "Erebus" was piloted to a point much further south in Wilmott and Crampton Bay, that would seem to explain the paucity of silverware from her officers -- and so, might the frequency of "Terror" forks and spoons then suggest its having sunk nearby? If so, this would certainly fit in with L.T. Burwash's theory that a Franklin ship sank in the vicinity. He said it was given to him by some of his tribe, and that it had come from one of the boat places, or where skeletons had been found on King William Land or Adelaide Peninsula, he could not remember exactly where. (see the "Schwatka" chapter of my Finding Franklin for a fuller account of this spoon). Since the vast majority of this silverware is now catalogued online, it's a question that offers at least the possibility of an "armchair" solution. 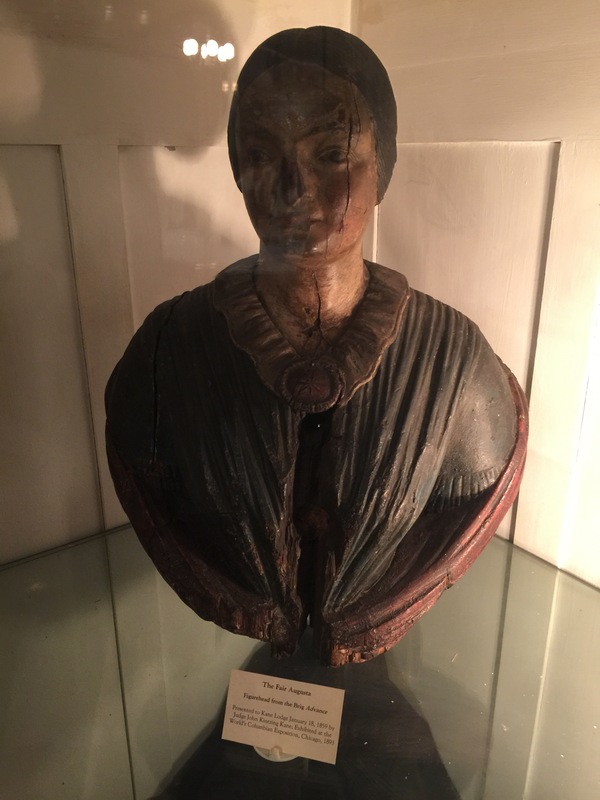 Most of them are catalogued at the National Maritime Museum at Greenwich, with a few others -- part of the Lefoy bequest that included Sophia Cracroft's collection -- are now at the Scott Polar Research Institute. Another small collection was retained by Dr. Rae, and later given by him to the University of Edinburgh, these do not seem to have been given detailed analysis (although, judging from the images as they appear in the SCRAN database, they unfortunately seem to have been polished! ).